Welcome to the Libsyn page for the No Fear of Falling Podcast! Thank you for taking the time to listen, and do not hesitate to contact us if you have any questions, comments, ideas for future episodes, we're happy to talk to you! 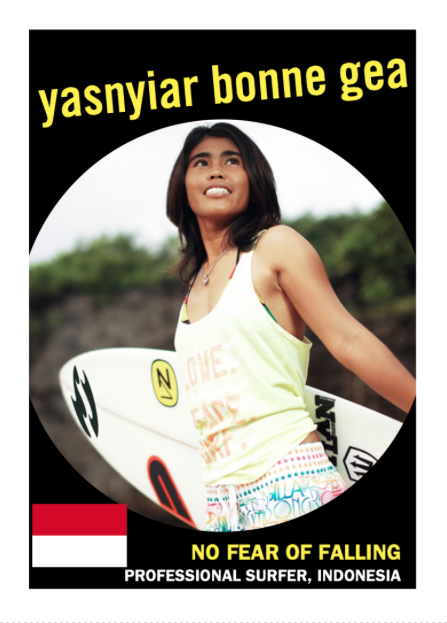 In this episode, we head to the beautiful beaches of Bali, Indonesia to talk to YASNYIAR BONNE GEA, a professional surfer who currently is crowdfunding over at our favorite crowdfunding platform MAKEACHAMP to raise funds for her upcoming competition schedule as she aims for the Asia Champion Title. She is a 5 Time Indonesian Women's Champion (2008, 2009, 2010, 2011, 2012), and a 2 Time Asian Champion (2011, 2014). What makes her story so fascinating is how she got to this point, in that Bonne was completely self-taught. She started surfing quite late in life (20-21), and she got herself to the point that she is now completely through hard work, trial and error, determination, and a love for being on the waves. We talked about her journey to get where she is now, about surf tourism in Indonesia, how surfing can be used for female empowerment, the parallels that surfing have on normal life, and you'll hear a touching story by her friend Lentera Lentaya (who also is the second voice you hear translating in this episode) talking about how she met Bonne and how amazing a person Bonne is. Celebrating and Learning from those that push the limits of the Human Condition. The No Fear of Falling Podcast speaks to men and women from around the world, in different walks of life, who all share the common characteristics of not being afraid to fail, and being determined and driven to achieve their goals.